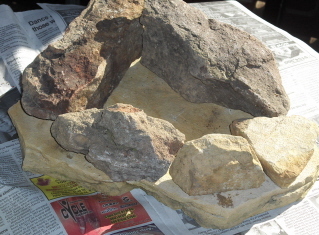 How to build a portable rock garden – Johntheplantman's stories, musings, and gardening. 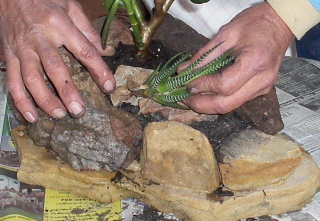 Several years ago, I figured out how to build a portable rock garden. The concept hit me when a client’s sister who was visiting from New York looked one of my large rock gardens and commented, “I wish I could take that home with me”. I thought this was such a good idea that I went home and spent several days of experimentation and trial and error. It felt really good to put my first specimen in the back seat of the lady’s car as she left to return home. A truly portable rock garden. Who would have thought it? I started by gathering my materials. 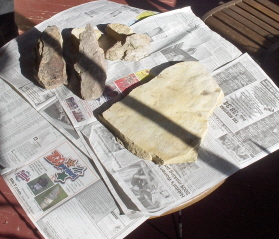 I picked up some nice sandstone specimens from the side of a mountain road and found a suitable piece of flagstone for the base (there are rock dealers all over the place these days). 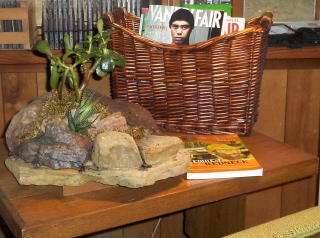 I got some moss from the back yard where the grass won’t grow, and some smaller rocks from a friend’s driveway. The rocks will be glued together with a polyurethane caulk. You will need a tube of this and a caulking gun. These are pretty inexpensive and one tube of caulk will do three or four gardens. I have tried other types of caulk but have found that nothing will do better than polyurethane. 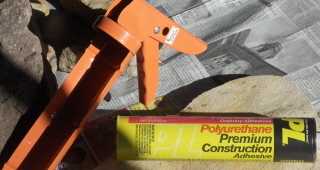 I use PL polyurethane construction adhesive. Be sure to use newspapers or some kind of drop cloth. The caulk is very hard to clean up. I got some on my jeans a few years ago. I still wear the jeans—the caulk is still there, also. 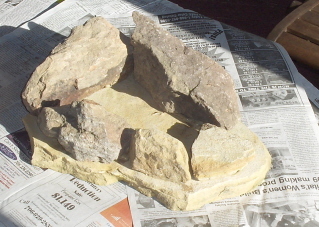 Begin by laying the decorative rocks out on the flat stone that will be the base. Experiment and get the rocks just as you want them. Some times it takes quite a bit of adjustment and experimentation. Take your time. Cut the tip of the caulking tube about ½ inch from the end. It works best if you cut it at an angle. Use a nail or something like that to poke a hole through the seal at the bottom of the tip. Insert the tube into the caulking gun and you are ready to go. If you’ve never used a caulking gun, it may take a little experimentation but it is relatively easy. 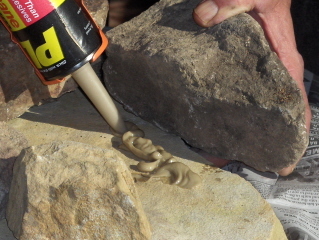 Next, carefully turn each rock to the side and spread a bead of the caulk on the base. When this is done, turn the rock back down on the base so that any excess glue will be pushed to the inside. Mash the rock down good and hard and then try not to move it around any more. Go slowly and do one rock at a time. When the gluing is finished, it will be time for the hard part. The hard part is that you must let the project dry and cure in a dry, warm location for a few days. Waiting is always difficult for me, but if you get in a hurry, you will mess it up. After the glue had dried, examine the project and look for little holes where dirt might run out and stuff little pieces of moss here and there to plug the holes. Now it is time to plant. You will need one larger accent plant. I am using a jade plant that has been pruned following the directions in my previous post “The simple basics of pruning”. Place the accent plant in the correct position—you will want to experiment. The root ball of this plant should be up high in order to form a “terrace”. Finish filling the planter with good potting soil. Pack it in around the accent plant and water everything. This will be a good time to wash off the excess dirt. To keep the feeling of a true rock garden, I like to build terraces with smaller rocks. Sometimes, if the shape and feel is right, I like to use aquarium gravel for a “river bed” or flat rocks for a “stepping stone path”. At this point, pack the dirt and the rocks in so they will stay. Terraces make the finished product look better. Be an artist. 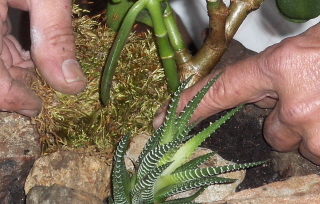 After studying the garden, I have decided to enhance the Ikebana effect with a smaller plant in one of the crevasses. I am using a haworthia here. 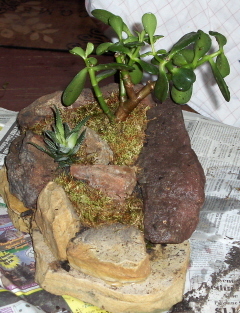 This will give me a three tiered effect with the difference in elevations of the jade, the haworthia, and some moss. An essay on Ikebana will be the subject of a future post. 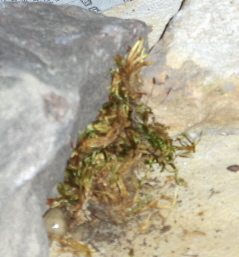 Now, I will pack moss on top of the soil and tuck it in around the rocks. The moss will live well if misted on a regular basis. The effect I am looking for is a woodland scene with the moss representing the garden floor. Here is the finished product ready to be watered in and set in a place of honor. Look at this. Now Bob will come in for his birthday dinner, admire the planter, and we will say “happy birthday”. 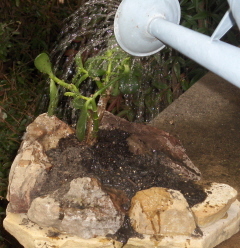 The plants will grow well in good light with a weekly watering. The moss will probably need misting every couple of days. 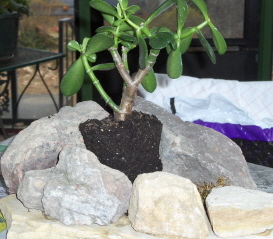 As the jade plant grows, proper pruning will enhance the bonsai effect. Yay!! near a window or under a floor lamp is perfect! What a lovely gift, especially for this time of the year. I bet Bob loved it! Your instructions are so clear maybe even I could make one. John, when I moved into my house in Portland I decided the entire front yard should be replaced with rocks, shrubs, and plants. I got rocks from everywhere and everyone. A good friend made her husband haul a rather large quartz rock back from a camping trip in eastern Oregon. He failed to see why I just had to have this rock. When I put my house up for sale I dug the rock out and hauled it inside because my friend has passed away and I just couldn’t leave the rock. Her husband came over hauled the rock back down the basement stairs and packed the rock in my car. I drove the rock across the country. 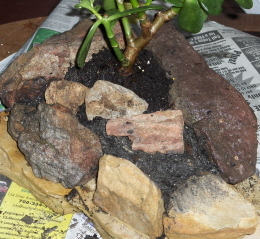 A portable rock garden! Now why didn’t I think of that in the first place? They looked at me kind of funny. Rocks are important. Rocks ARE important! After all, ponies live under them. I could make me a portable rock garden just by following these easy instructions. And remember, you can get the rocks for free if you just look around a bit. I sense a weekend project coming on!